* This appendix was prepared after my attention was directed to a paper by Murphy et al. (2000). One of the authors of that article, Alfred A. Levinson, Professor Emeritus, Department of Geology and Geophysics, University of Calgary, Alberta, Canada, reviewed the next-to-final draft of this appendix and arranged for Figure 1 to be included. Although I knew the literature of archaeology and anthropology includes much information about rocks fashioned into, for example, ornamental and decorative artifacts, I did not search that literature intensively while compiling data during preparation of material included in the preceding parts of this web site file. My rationale, granted negativistic, was based on two things: 1) my finding many obvious errors so far as the identification of the constituent rocks and minerals during my early examination of several publications in the field -- see, for example, the annotation to the article by R.K. Liu (1995) in Appendix C and 2) discussions with professionals in the general field about how and by whom the identifications, especially in the past, were usually made. My rationale was that I did not want to perpetuate possibly incorrect data or to repeat it with qualifiers at least some of which might have been inappropriate. Tentatively, I changed my mind upon reading the article by Murphy et al. (2000), when I saw that A.A. Levinson, a mineralogist, was one of the coauthors and read the methods he used to identify the recorded materials. Thus, it seemed only prudent to look more closely at more publications in the field to see if any additional gemrocks other than the diorite and tuff recorded by Murphy et al. (op cit.) had also been identified on "good grounds" and missed when I compiled the information reported in the main part of this web site file. Consequently, I decided to review relatively recently published, apparently well-documented archaeological literature treating largely, or completely, some limited geographical region. I thought such a review would give me an idea as to whether it might be worthwhile to make a more broadly based search -- i.e., would an extended search of the pertinent world-wide literature likely lead to my finding noteworthy additional gemrocks(?). Lacking a good knowledge of sources of such literature, I contacted Al Levinson, and he came to my rescue by kindly supplying copies of a few pertinent publications in his file that deal with the Caribbean region. In reviewing those articles, along with a few other publications cited in the bibliographies of those papers about archaeological sites in the Caribbean Region (see Selected References at the end of this appendix), I found the information summarized under the next two subheadings. Table 1. Rocks found to constitute artifacts in pre-Columbian archaeological sites in the Caribbean Region. Diorite and tuff are in bold face because they were not recorded as having been used as gemrocks on the original GemRocks document. Short descriptions of these two rocks are given succeeding the table. Numbers enclosed in parentheses following the entries correspond to the numbers preceding the sources listed in the Selected References. Diorite, is defined by most professional geologists as a phaneritic (i.e., macroscopically crystalline) igneous rock that consists of 50 to 70 percent of a light colored plagioclase feldspar, 30 to 50 percent varietal minerals (typically, in order of probable presence, hornblende + biotite + augite), and less than 5 percent quartz. Properties for the two chief minerals, as they occur in diorite, follow: Plagioclase feldspar (which is typically andesine) -- off-white to buff; H. 6-6½; S.G. 2.65-2.70; subtranslucent to opaque; pearly luster; two cleavages a few degrees off 90 degrees to each other; closely spaced parallel lines can be seen when certain cleavage surfaces are viewed through a simple (e.g., 10x) hand lens. Hornblende (an amphibole) - black to greenish black; H. 6; S.G. 3.0-3.4; subtranslucent to opaque; luster differs from surface to surface, typically with cleavage surfaces subvitreous and other surfaces dull to pearly; two cleavages that meet at approximately 54 and 126 degrees; grains are commonly tabular. Attention is directed to the description of "Granite" in the entry section of this web site, which includes the following: "In the marketplace, the term granite is frequently extended to include virtually all light colored igneous and igneous-appearing rocks that roughly resemble granite, sensu stricto. - Most of these other rocks, which are so-designated in the market, are monzonites and granodiorites, but a few are diorites [italics and underline not in original] and syenites in accepted petrographic nomenclature." To get an alternative conception about compositional differences of granite and diorite, attention is directed to the diagram included on the "Stones: Addenda" file on this web site; and, more complete definitions of the names applied by petrographers to these other "granites" ... can be seen in books such as "Rocks and Rock Minerals" by Dietrich and Skinner (1979). Figure 1. Diorite beads and a zemi (lower left) from the Pre-Columbian (250-500 A.D.) jewelry manufacturing center at the Elliot's site of east-central Antigua. The predominant constituents are the off-white plagioclase (andesine) and dark colored amphibole (hornblende). The largest (broken) bead is about 4.4 cm in longest dimension. (© photo courtesy of G. Newlands, Department of Archaeology, University of Calgary). 1. Nature of the constituent fragments. -- That is, are most of the fragments glass, mineral or rock(?). A tuff made up of 25 percent or more of any one of these types of fragments is designated, respectively, as vitric, crystal or lithic, with a fourth category of "mixed" for tuffs with more than one of these constituents making up at least 25 percent of the rock). 2. Composition of the total rock. -- No matter what procedure is required to determine the composition (be it macroscopic or microscopic observation or chemical analysis), the name applied is that of the equivalent aphanitic rock -- e.g., a tuff within the range that of granites and their aphanitic "equivalent" rhyolites would be called a rhyolite tuff. 3. Size of the constituent fragments. -- For example, a tuff made up wholly or largely of fragments < 2 mm in greatest dimension would be called an ash tuff whereas a tuff made up wholly or largely of fragments that range between 2 and 64 mm in greatest dimension would be called a lapilli tuff. Consequently, a well-studied tuff should have a descriptive name with three adjectives modifying the word tuff. An example would be a mixed rhyolite ash tuff -- a relatively common one, by the way. In much of the pertinent geological literature, however, tuff is termed merely tuff or as tuff with only one or two of the just alluded to adjectives - e.g., rhyolite tuff or rhyolite ash tuff. Caution: One should be careful not to confuse the term tuff with the term tufa. The terms apply to two completely different rocks, both composition- and genesis-wise. The designation calcareous tufa, a synonym of calcareous sinter, is applied to travertine that is so-to-speak spongy, is deposited by springs, and commonly encases reeds etc. – For a description of travertine, see that entry in the main part of this web-site file. Some of the artifacts recorded as made from the rocks listed in Table 1 are tools and weapons rather than gems or ornamental and decorative items. Both uses, which seem well worth mentioning here, include the following: an adz(sic), diverse amulets, axes, bead blanks, beads of several shapes and sizes, a blade, celts, condor-shaped (i.e., big-beaked birds) pieces, frog-shaped pendants and ornaments (some of which are segmented), grater boards (so-to-speak forerunners of abrasive papers etc. ), a tablet and zemis, which are described as "distinctive pointed religious objects" (Murphy et al., 2000). As a result of my literature review -- albeit limited to relatively recent publications treating only one geographical region -- I think it would not be worth the time and efforts necessary to extend my literature search further into reports relating to this field of endeavor, at least so far as looking for additional kinds of rocks used as gemrocks. Two considerations lead to this conclusion: 1) It seems unlikely that many more common or widely available rocks used to fashion gemstones, ornaments or curio stones are recorded in that literature. [and] 2) I found recorded identities that are highly suspect. Indeed, as a result of this latter aspect, I also consider it prudent to advise anyone who really needs to the know the true identity of a rock constituting any given artifact to have a professional mineralogist or petrologist reexamine and identify the material of that artifact. Nonetheless, it is noteworthy that a vast literature including information about artifacts from archaeological sites does exist and some of it contains valuable facts of possible use to anyone interested in gemrocks -- e.g., such things as when and by whom the artifacts were collected; how and by whom they were identified; whether the artifacts are still preserved and if so, where; and, in some cases, statements indicating the availability of such specimens for observation and/or additional investigation. For anyone who wishes to get into this literature, good places to start are the "Art Index," which goes back to 1929, or "Art Abstracts." (1) Ball, S.H. 1941. The mining of gems and ornamental stones by American Indians. Smithsonian Institution, Bureau of American Ethnology (Anthropological Papers), Bulletin 128. (2) Cody, A. 1991. Distribution of exotic stone artifacts through the lesser antilles: Their implications for prehistoric interaction and exchange. Proceedings of the Fourteenth Congress of the International Association for Caribbean Archaeology (Barbados). p. 204-213. (3) Crock, J.G. and R.N. Bartone. 1998. Archaeology of Trants, Montserrat. Part 4. Flaked stone and stone bead industries. Annals of Carnegie Museum. 67(#3):197-224. (4) Francis, Peter, Jr. 1994. Sowing the beads of change, Part 1. Lapidary Journal. 48(#7):79-81 & 84. (5) Murphy, A.R., D.J. Hozjan, C.N. deMille, and A.A. Levinson. 2000. Pre-Columbian gems and ornamental materials from Antigua, West Indies. Gems & Gemology. 36:234-245. (6) Watters, D.R. 1997. 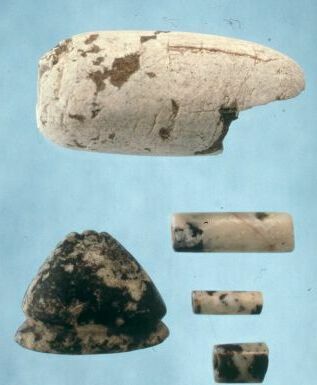 Stone beads in the prehistoric Caribbean. Bead study trust newsletter. 29:7-8. (7) Watters, D.R. and R. Scaglion. 1994. Beads and pendants from Trants, Montserrat: Implications for the prehistoric lapidary industry of the Caribbean. Annals of Carnegie Museum. 63(#3):215-237.